Global temperatures are compiled for various areas including global (land-ocean), global (meteorological stations), three latitude bands, and hemispheric, by the Goddard Institute for Space Studies of NASA. The graph shows the monthly mean global surface temperature anomaly from the base period 1951-1980, for the period 1996- January 2019. Graphs and tables are updated around the middle of every month using current data files from NOAA GHCN v3 (meteorological stations), ERSST v4 (ocean areas), and SCAR (Antarctic stations), combined as described in our December 2010 publication (Hansen et al. 2010). These updated files incorporate reports for the previous month and also late reports and corrections for earlier month. The basic GISS temperature analysis scheme was defined in the late 1970's by James Hansen when a method of estimating global temperature change was needed for comparison with one-dimensional global climate models. The scheme was based on the finding that the correlation of temperature change was reasonably strong for stations separated by up to 1200 km, especially at middle and high latitudes. This fact proved sufficient to obtain useful estimates for global mean temperature changes. 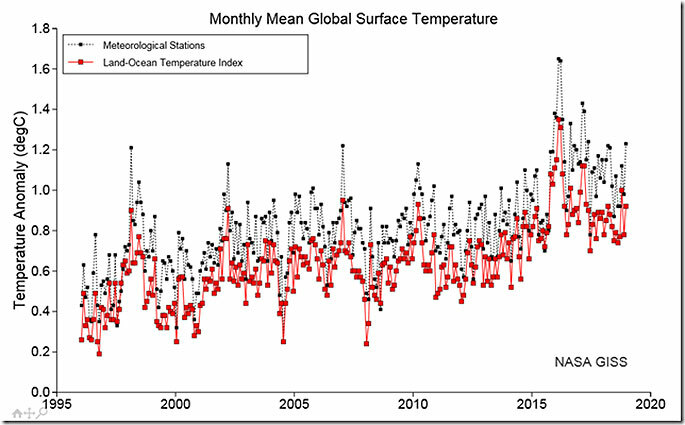 he chart below shows that from 1997 to January 2019 there has been a small warming in the global monthly temperatures, and a relatively warm period associated with the recent 2015-2017 El Nino events.